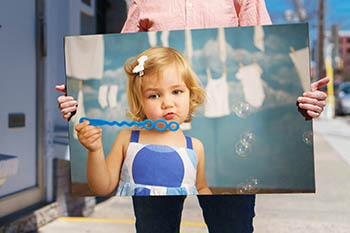 Make a bold statement and showcase your photos with an eye-catching canvas gallery wrap. Thanks to digital printing techniques, you can display your favorite images using the time-honored tradition of presenting art on a wrapped frame. Your Photos Will Look Great on Canvas! Whether you’re looking to feature a set of great family photos or elevate that one in a million selfie shot, our canvas gallery wraps are the perfect fit! Because we produce each canvas wrap individually in-house, we’re able to give your photo the attention it deserves during the production process. From our museum quality 1.75″ backers to the included hanging hardware, we make sure each canvas gallery wrap is as special as the moments they encapsulate. Canvas gallery wraps are the perfect way to dress up your home, office, or anywhere you’d like to make a bold impression. With additional options such as interesting collage styles and other special effects available, we can help you turn your photos into works of art! Whether you drop by our Lancaster, PA or Hershey, PA retail stores or are visiting us online, we make ordering your canvas wrap easy. Let us help you create a gallery-style art piece for your home or office! If you have any questions about canvas gallery wraps, please contact us today. We’ll do our best to help you in any way we can.